Long ago, I gave up my high school dreams of becoming the next Carl Sagan and instead wound up working (in order) at a video rental store, a used bookstore, a computer seller, Kinko's, a Jewish newspaper company, and an HR firm. I eventually became a teacher of intercultural communication in Kyoto, where I vainly attempt to apply quantum mechanics to language teaching, practice martial arts and Zen Buddhism, and always keep one eye on the sky. Adam's Stepsons stems from an ongoing personal quest exploring the nature of identity and self-expression, interweaving both religious and scientific themes. It's also the first step toward world-building; the Far Asian Consortium, the United Americas, and the Greater Indian Empire will reappear in a struggle for the Mars Colonies and the future of humanity in a series of novels currently being written. Volume one is tentatively titled The Bringer of Light, draft completed by end of summer, 2017. Key concepts in my work are, what does it mean to be human? and, what does is mean to be "me"? Adam's Stepsons is a military science fiction novella written by M. Thomas Apple. To the military establishment at Armed Forces HQ, the clones were things, to be addressed using the pronoun "it", but their creator, Dr. Heimann, had considerable difficulty conforming with that protocol. Granted, they were the result of a scientific act rather than begotten as a true human would have been, but they were still flesh, blood and brain, fully functional human beings. Heimann's quandary was increased by the fact that the cloning had used the cells of his nephew, a young man he had raised ever since the boy's parents died in a skirmish years before. Patel had died in a crash and using his cells for the process was the most expedient means of getting the cloning process going. While his theories had formed the basis of the entire project, Heimann had been vocal in opposing it. The clones would be subliminally programmed and engineered to be killing machines. They would be sent to Mars as a genetically enhanced and deadly force whose target would be anyone of the Far Asian Consortium. The process was riddled with problems, however, as these cloned organisms sprang forth as fully formed adults with no childhood or developmental phase. The AF’s rigorous dehumanizing treatment seemed reckless and insufficient, prone to failure. Number Six was one such possible aberration. He had inexplicable memories of a crash on Mars. He also wondered why Dr. Heimann called him Seth instead of Number Six, and he began to question the restrictions imposed upon him and the others. Much as Dr. Heimann cared for that being who so recalled his nephew, he began to fear the clone who might have retained the worst of human emotions. M. Thomas Apple's high-tech science fiction novella, Adam's Stepsons, confronts the ethical issues surrounding cloning head-on as Dr. Heimann's "sons" are systematically dehumanized and considered as little more than high-functioning military equipment. Apple's thoughtful and ethically minded Dr. Heimann is the perfect narrator for this thought-provoking and chilling science fiction story, and anyone who remembers Patrick McGoohan's mesmerizing futuristic television series, The Prisoner, will appreciate Heimann and Seth's conversation about the significance of Number Six. As I read, I could hear McGoohan's character proclaiming loudly and angrily, "I am not a number; I am a free man!" and found it a startling contrast with the way the clones are treated in this gripping futuristic tale. The characters of Heimann and Six are well-defined, and the developing tensions between the erstwhile father and son make this tale hard to put down. Adam's Stepsons is most highly recommended. Adam's Stepsons by M. Thomas Apple is a thrilling science fiction novel. It is told from the perspectives of Doctor Heimann and Seth. Doctor Heimann creates clones of dead people. The clones are then made into soldiers, with above average strength and intelligence. A lot of people tell Doctor Heimann that clones aren't people, that they don't have feelings, that they're an 'it' not a 'he', but they're soon proved wrong. Seth is one of those clones, but he is not just a clone. He's becoming self-aware. He's learning past what he was taught. Seth isn't just a clone now, because he has feelings. And then he attacks the other clones. What will they do? I really enjoyed reading Adam's Stepsons by M. Thomas Apple. I was hooked by the first page and I couldn't put the book down. The plot twist was amazing and made me gasp out loud. There were also a few funny parts. The book is very well-written and descriptive. The characters are all very likeable. I liked how the book was written with different perspectives so you can see what other characters thought as well. There are many action scenes that are super exciting. The story was well developed and thought out. The book causes you to think about whether or not you believe a clone is a person, among other things. I would recommend this book to readers who enjoy science fiction. A wonderful introduction to this science fiction novel gets us into the story right away. Doctors create several clones in a lab and then enhance them so they’re stronger and smarter than the average person. Toying with scientific reincarnation, Adam’s Stepsons by M Thomas Apple takes us into a controversial area of genetic immortality. The last three chapters include a plot twist to a book that you won’t be able to put down. Although our main character, Doctor Heimann, was advised not to give the clones a name and just call them by number, he does name Number Six Seth. Now they’ve created Number Ten who may run faster than the others. In a battle simulator, Number Six, or Seth, has flashbacks to a previous self where the clone feels as if he—or his donor—has flown a plane before and shot at other bogeys before. Even though Seth is a soldier clone, he questions his memories and why he still lacks certain knowledge. He yearns to know more than what is programmed into him. Adam’s Stepsons is a very well written science fiction novel that has readers wondering if cloning and genetic engineering are possible. Can a clone with the same DNA, same hair color, same eye color, and fingerprints as a deceased human be considered a human or is the clone an 'it'? What if the experiment does not go well, can you kill him or it? Adam’s Stepsons by M. Thomas Apple raises a lot of questions that will have the reader thinking about these legal and ethical questions and more. War has severely reduced the population able to fight so the military leaders of the United Americas Armed Forces are working to clone ultimate warriors. Adam’s Stepsons by M. Thomas Apple follows the development of Number Six, the first of a set of 12 clones to successfully mature and function. Unfortunately, these clones are based on the DNA of the lead doctor’s adopted son, Seth, who was killed in action. Dr. Johann Heimann is tired of the destruction of living beings and sees that Number Six has demonstrated emotional growth and the use of logic, which is not supposed to be part of the clones’ training. As Heimann tries to see Number Six as a living being, the military leaders see only machines. Seth, as Number Six is known to Dr. Heimann, accesses the instructional programming, hacks into the base data and manages to learn much more than he should, creating a crisis among the Moon Base team. Can Dr. Heimann and his staff bring Number Six back into line or has all their work created a situation they are incapable of handling? Deeply moving in the consideration of the meaning of life and the soul, Adam’s Stepsons by M. Thomas Apple is an excellent short story with plenty of surprises. The clear differences between emotion and pure logic, human relations and military goals, and love and duty are examined as the characters follow their beliefs and training. The writing is concise, the characters are well differentiated and the possibilities of what life in the future may bring are thought provoking. This is an excellent story that could easily be read over and over to discover the subtle nuances of the human psyche. Great story with plenty of food for thought. What a surprise ending! Clones were supposed to make the world run better. They were supposed to be the ultimate fighting machines that would kill the enemy with impunity and without remorse. But when one of the clones begins to develop his own emotional compass, things become far more dangerous than anyone could have imagined. Six has memories that weren’t intentionally given to him, and his understanding seems to be growing at an amazing rate. For Doctor Heimann, it’s a mixed blessing and he’s not sure whether Six being more like Patel is something he likes, or something that terrifies him. But that’s nothing compared to what Six will find when he has a chance to explore the computers more, and what all of them will go through to protect their world in Adam’s Stepsons by M. Thomas Apple. This book is a page-turner. You'll really want to keep going to find out more and more. It’s interesting, full of action and definitely a futuristic piece. If you’re interested in the future, then it’s something you should be considering before you encourage too much technological advancement - after all, there are things we don’t know and that’s what this book is all about. It’s a short read, but long enough to let you really get to know the characters and want them to succeed, though just who you’re rooting for is going to be more difficult than you might think. Adam’s Stepsons by M. Thomas Apple is a book that really makes you think. M. Thomas Apple’s tale of a terraformed Moon and war on Mars could have tracked any one of the well-worn paths of imagined worlds where advanced cloning and memory implantation are used to produce super-human soldiers. 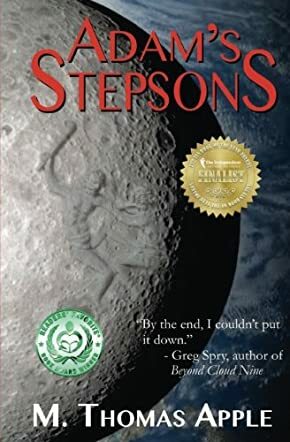 In the deft hands of the author, however, the idea is taken down a new and thought-provoking path in Adam's Stepsons as he infuses a refreshing dose of humanity into the popular theme. And, as with any good shorter piece, a revelation at the end makes you glad you carried through to the finale.